Victor Oladipo led the team in points per game (23.1) and steals per game (2.4), both career highs. Victor Oladipo’s breakout season was finally recognized on Monday when it was announced the Pacers guard won the NBA’s Most Improved Player award. Oladipo led the league in steals, led the Pacers in points per game (23.1) and made his first All-Star team. Oladipo also helped lead the team to a seven-game showdown with the Cleveland Cavaliers in the first round of the NBA playoffs. “I would like to congratulate Victor on winning the Most Improved Player Award,” said Pacers President of Basketball Operations Kevin Pritchard. “It’s an honor that is well-deserved and well-earned. The saying, ‘hard work pays off’ is epitomized by what Victor accomplished in winning this award. 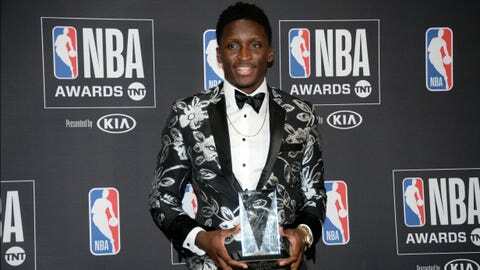 Oladipo beat out the Houston Rockets’ Clint Capela and the Brooklyn Nets’ Spencer Dinwiddie for the award.